The development of the periodic table of the elements parallels the development of science and our understanding of the physical universe. It is central to our current understanding of the "stuff" we are all made from. The earliest attempts to understand matter were primarily philosophical without recourse to strict experimental verification. Thus, although some of the chemical elements have been known since antiquity there was no attempt to systematically arrange them according to their properties. As science developed through the eighteenth and nineteenth centuries the rate of discovery of new elements increased. By 1809, a total of 47 elements had been discovered, and by 1863, 56 were known. As the number of known elements grew, scientists began to recognize patterns in their properties and began to devise ways to classify them. Lavoisier's Traité Élémentaire de Chimie (Elementary Treatise of Chemistry, 1789, translated into English by Robert Kerr) is considered to be the first modern chemical textbook. It contained a list of elements, or substances that could not be broken down further, which included oxygen, nitrogen, hydrogen, phosphorus, mercury, zinc, and sulfur. It also forms the basis for the modern list of elements. His list, however, also included light and caloric, which he believed to be material substances. While many leading chemists of the time refused to believe Lavoisier's new revelations, the Elementary Treatise was written well enough to convince the younger generation. Berzelius was a Swedish chemist. 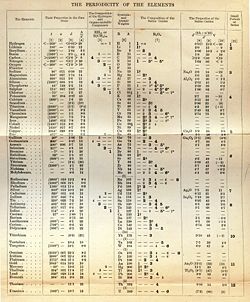 In 1828 he compiled a table of relative atomic weights, where oxygen was set to 100, and which included all of the elements known at the time. Of significance for the periodic table is that he invented the modern system of chemical notation and established the basic symbols for the elements as used today. In this system elements are given symbols, and compounds represented by combining element symbols and numbers representing proportions. Students working in Berzelius laboratory are credited with discovering lithium, and vanadium. Other elements attributed to Berzelius are silicon, selenium, thorium, and cerium. Together with John Dalton and Antoine Lavoisier he is considered a father of modern chemistry. Döbereiner was a German chemist. As a coachman's son, he had little opportunity for formal schooling, but was apprenticed to an apothecary, read widely, and attended science lectures. Eventually from 1810 he was professor of the University of Jena. He discovered furfural, worked on the use of platinum as a catalyst, and invented a lighter, known as Döbereiner's Lamp. With regard to the periodic table he is known especially for his discovery of triads of elements in 1829. He identified groups of three chemically similar elements that today we understand fall in the same group or family of the periodic table. John Newlands was an English chemist who wrote a paper in 1863 that classified the 56 elements that had been discovered at the time into 11 groups which were based on similar physical properties. He noted that many pairs of similar elements existed which differed by some multiple of eight in atomic weight. 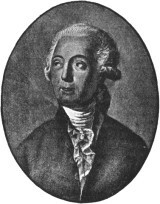 Newlands took Döbereiner's ideas and expanded on them. He also organized his elements by mass and property, but he added a twist. Döbereiner had worked only in small groups, but Newlands wanted to relate all the elements to each other. Newlands arranged the known elements in a table by atomic weights. In doing so, he noticed some recurring patterns, and the patterns were such that if he broke up his list of elements into groups of seven, the first elements in each of those groups were similar to one another, as was the second element in each group, and the third, and so on. By analogy with the tonic musical scale of seven notes, which form octaves, he called his discovery the Law of Octaves. Newlands also noticed that silicon and tin formed part of a triad and so predicted a third unknown element with atomic weight of about 73, anticipating Mendeleev's prediction of germanium by six years, but did not leave a space for the new element in his table. Newlands' work was heavily criticized, even ridiculed, by other chemists, because of the lack of spaces for undiscovered elements and the placing of two elements in one box, but he was finally awarded the Davy Medal by the Royal Society in 1887. As the number of known elements increased two men working independently created the first periodic tables at about the same time. These two were Julius Lothar Meyer and Dimitri Mendeleev. Meyer published some data first, but didn't publish a table till a few months after Mendeleev. Meyer and Mendeleyev can be considered the cocreators of the periodic table, though most agree that Mendeleyev's accurate predictions land him the larger share of credit. At the time it was Mendeleev's predictions that greatly impressed his contemporaries especially when they were eventually found to be correct. Meyer was contemporary with Mendeleev; he qualified in medicine at Zürich, Switzerland, and then studied and taught at various German universities. Thought his first interest was physiology he was primarily interested in chemistry. Meyer was examining the physical properties of the elements and noticed a periodicity in their molar volume. In 1864, Meyer published a preliminary list of 28 elements classified into 6 families by their valence—this was the first time that the elements had been grouped and ordered according to their valence. Work on organizing the elements by atomic weight had hitherto been stymied by inaccurate measurements of the atomic weights. Then in 1868 he prepared an expanded version, and in 1870 published his list as a table that in many ways was similar to Mendeleev's. Page from the first English edition of Mendeleev's textbook (1891, based on the Russian fifth edition). It shows the variations of chemical properties with atomic weight that he used to compile his periodic table. The periods are represented (right column), but the groups are not shown. Dmitri Mendeleev, (also spelled Mendeleyev, middle name (patronymic) Ivanovich, was a Siberian-born Russian chemist. Mendeleev was investigating the variation in the chemical properties of the elements (see image at right) and noticed their periodic variation. He arranged the elements in a table ordered by atomic mass. On March 6, 1869, a formal presentation was made to the Russian Chemical Society, entitled The Dependence Between the Properties of the Atomic Weights of the Elements. His table was initially published in an obscure Russian journal but quickly republished in a German journal, Zeitschrift für Chemie, in 1869. The arrangement of the elements, or of groups of elements in the order of their atomic weights, corresponds to their so-called valencies, as well as, to some extent, to their distinctive chemical properties; as is apparent among other series in that of Li, Be, Ba, C, N, O, and Sn. The elements that are the most widely diffused have small atomic weights. We must expect the discovery of many as yet unknown elements–for example, elements analogous to aluminum and silicon–whose atomic weight would be between 65 and 75. The atomic weight of an element may sometimes be amended by knowledge of those of its contiguous elements. Thus the atomic weight of tellurium must lie between 123 and 126, and cannot be 128. On the evening of April 19, 1894, William Ramsay attended a lecture given by Lord Rayleigh. Rayleigh had noticed a discrepancy between the density of nitrogen made by chemical synthesis and nitrogen isolated from the air by removal of the other known components. After a short discussion he and Ramsay decided to follow this up. By August Ramsay could write to Rayleigh to announce that he had isolated a heavy component of air previously unknown which did not appear to have any obvious chemical reactivity. He named the gas "argon." In the years that followed he discovered neon, krypton, and xenon. He also isolated helium which had been observed in the spectrum of the sun but had not been found on earth. In 1910 he also isolated and characterized radon. These noble gasses were initially incorporated into Mendeleev's table as a zero group and placed before the group I elements of each period. The early part of the twentieth century saw rapid advances in our understanding of the structure of matter and concomitantly changes in the periodic table. The noble gasses were placed at the end of the periods rather than at the beginning. Periods four and up were found to be longer than one through three as the transition metals were placed correctly, and the shorter periods were divided. In 1911 Rutherford demonstrated that atoms had a nucleus where most of the mass and all the positive charge of the atom resided. The nuclear charge, or atomic number (the number of protons in the nucleus}, became the organizing principle of the table. In 1913, Henry Moseley found a relationship between an element's X-ray wavelength and its atomic number. Before this discovery, atomic numbers were just random numbers based on an element's atomic weight. Moseley's discovery showed that atomic numbers were not arbitrary but had an experimentally measurable basis. Mosley's research demonstrated that the ordering of elements in the table should be according to atomic number not atomic weight. This resolved some issues that even Mendeleev had been aware of. His work also showed that there were gaps in the table at atomic numbers 43 and 61 that are now known to be radioactive and not naturally occurring. Following in the footsteps of Dmitriy Mendeleyev, Henry Moseley also predicted new elements. Of Swedish ancestry, Seaborg was born in Ishpeming, Michigan. He received a bachelor's degree in chemistry at the University of California, Los Angeles in 1934. He took his doctorate in chemistry (even though his dissertation was in physics) at the University of California, Berkeley, in 1937. In 1939 he became an instructor in chemistry at Berkeley, was promoted to professor in 1945, and served as chancellor from 1958 to 1961. In his early research, he utilized cyclotron bombardment to create more than 50 atomic isotopes including several still used in medical applications today. In 1941 he is credited with discovering and isolating plutonium, and subsequently the transuranic elements from atomic number 94 through 102. His work in the transuranic elements led to a reconfiguration of the periodic table where he placed the actinide series below the lanthanide series at the bottom of the table, to give the periodic table the look it has today. In recognition of his contributions, element 106 was called seaborgium in his honor. Web page listing several scholarly and semi-popular articles on various aspects of the periodic system and underlying theoretical concepts. Some are downloadable. History of "History of the periodic table"
This page was last modified on 11 January 2018, at 16:37.